I don’t generally like peak lapels on single-breasted suits. They aren’t necessarily wrong – although notch lapels are far more common, only the relatively inexperienced will tell you it is a ‘rule’ that SBs must have notch lapels (or indeed black tie have peak lapels). Have a look back through some 1930s stills or films and you will find plenty of evidence to the contrary. But peak lapels, for me, often look short and stubby on a single-breasted jacket. More like little bat wings than long, elegant fins. On a double-breasted, the crossover allows the lapel a crucial few inches more, echoing the smart military style of a sash or cross-belt. 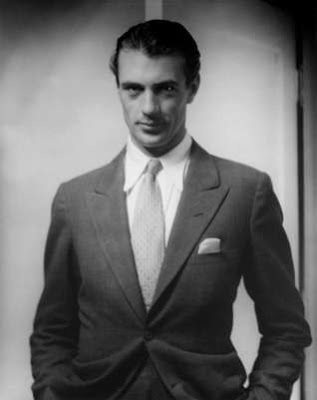 The image of Gary Cooper above I think illustrates the point. Part of the problem is that these old suits had a higher buttoning point – where the waist button, the top of a two-button suit, fastens. They were cut with that point on the natural waist, just below the ribs, where the trousers also sat. That leaves less room for lapel. The only way to save a peak-lapel SB design, then, is to lower that buttoning point as much as possible. They tend to be a good couple of inches lower on high-street suits today, but bespoke tailors will often retain a high waist button, even if the trousers are cut rather lower. The proportions of the jacket, after all, are still mostly derived from the same system of cutting that was developed for the hunting coat, which buttoned high and cut away sharply to allow it to be worn closed while mounted. 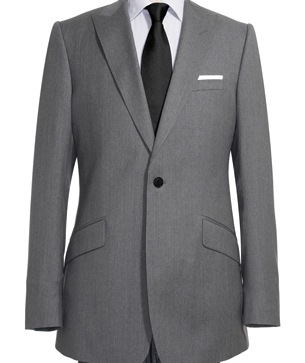 High-street retailers still retain a high buttoning point sometimes, as shown in the Reiss suit opposite. But below, you can see the difference of just an inch or so, in an Armani suit being worn by Kobe Bryant. And it’s no coincidence that peak lapels were often cut for more formal, three-piece suits like the grey Bryant wears. As these may have been worn open more often, the lapel has rather more freedom. Finally Gianluca Bocache, of the shop Sartoria Ripense in Rome, shows how the buttoning point can work well in a custom-made suit. I repeat that I don’t like peak lapels and I still think this would look better as a notch, but if you’re going to do it, then give the lapel a little more length. 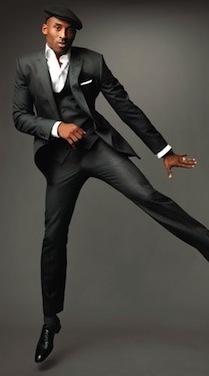 You can follow the discussion on Peak-lapel single breasted suits by entering your email address in the box below. You will then receive an email every time a new comment is added. These will also contain a link to a page where you can stop the alerts, and remove all of your related data from the site. I disagree. What really matters is the width of the lapel. 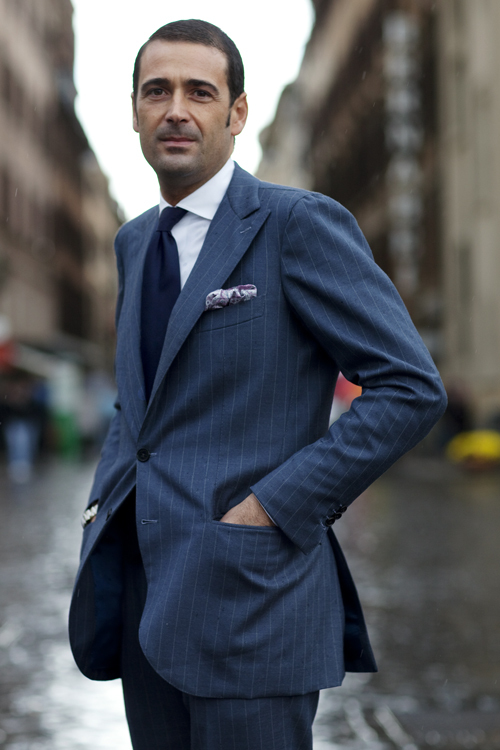 If peaked lapels are narrow, they won’t look stubby even with a high button. On the other hand, if the peaked lapels are wide, they will look strange with either high or low buttons. With high buttons, they will look short and stubby. With low buttons, they will look loose and flappy. The natural width of a lapel is the width it would be if it actually buttoned all the way up to the neck, instead of folding over. In the 30s, when lapels looked short and stubby, they were significantly wider than that. To look sleek and pointed, a peak lapel needs to be cut a little narrower than natural width. To look full and luxurious, as if showing off that the wearer has cloth and style to spare, they can be cut wider (something that’s hard to do with a notch lapel). Hence, the 30s look. I think that they look better with wide lapels. Look at the Edward Sexton suits. I think they look fantastic. I don’t like them in general – they look too comical on a single breasted suit. I had a lovely one button, single breasted, peak lapel jacket made by John Kent for my wedding. When done well (like mine, but I’m biased! ), I think it looks great. SC– Could not agree with you more!!! Your first sentence sums it up. Just FYI, Ripense and Gian Luca parted their ways. Gian Luca has opened a new store on his own (Bocache Salvucci) that is totally independant from Ripense. The latter has developed a new partnership with another shoemaker. Interesting post and spot-on, in my opinion. I have an RLPL 3-piece (my favorite suit), but it only works (in my opinion) because of the lower button stance that allows more room for the lapels to “develop”. Hi Christopher, could you possibly post a picture of your one button, single breasted, peaked lapel suit. I ‘m looking to get a similar one from John. If it was good enough for the circa 1928-37 period, it’s good enough for me. I can’t say that I see anything worthwhile in the past sixty years’ worth of men’s suits–it’s all just rehashing and copying various decades. The late 1920’s/early 1930’s are a darn sight better than all the Beatles wannabes walking around the past few years. This too shall pass. Would you apply the same logic to black tie and, therefore, have a preference for a shawl collar on a single breasted dinner jacket? Hi Simon is a rolled lapel easily achieved with linen? I’m about to commission a sports coat and really want a “nonchalant appearance”.